Food safety is vital for consumer confidence, and the hygienic design of food processing facilities is central to the manufacture of safe products. 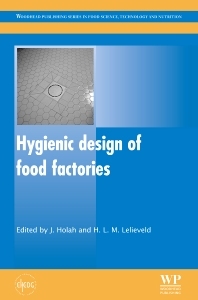 Hygienic design of food factories provides an authoritative overview of hygiene control in the design, construction and renovation of food factories. The business case for a new or refurbished food factory, its equipment needs and the impacts on factory design and construction are considered in two introductory chapters. Part one then reviews the implications of hygiene and construction regulation in various countries on food factory design. Retailer requirements are also discussed. Part two describes site selection, factory layout and the associated issue of airflow. Parts three, four and five then address the hygienic design of essential parts of a food factory. These include walls, ceilings, floors, selected utility and process support systems, entry and exit points, storage areas and changing rooms. Lastly part six covers the management of building work and factory inspection when commissioning the plant. With its distinguished editors and international team of contributors, Hygienic design of food factories is an essential reference for managers of food factories, food plant engineers and all those with an academic research interest in the field. Managers of food factories, food plant engineers and all those with an academic research interest in the field. Prof. Dr. h.c. H.L.M. (Huub) Lelieveld is President of the Global Harmonization Initiative and Fellow of the International Academy of Food Science and Technology. He editor or co-editor of numerous books, including several on hygiene and food safety management; novel food processing technologies and harmonization of food safety regulations. He produced chapters for many books and encyclopaedia, hundreds of scientific articles and articles for magazines and presented hundreds of papers, globally. He has been awarded doctor honoris causa at the National University of Food Technologies in Kiev, Ukraine.